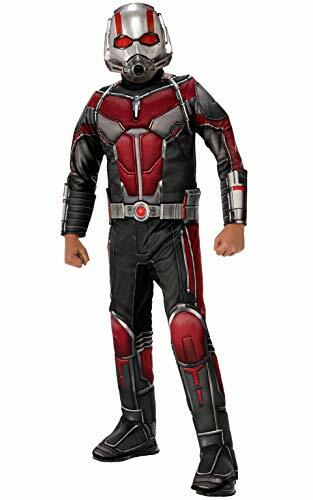 Officially licensed Ant-Man Deluxe Costume. Packing strength of giant proportions in miniature form, Ant-Man is on a mission to save the world! Imagine employing the secret powers of his suit in an officially licensed Ant-Man costume. Rubie's Costume Company has been bringing costumes and accessories to the world since 1950. As the world's costume leader, we take seriously the mission to make dressing up fun. Mascots, rental quality costumes, masks, wigs, accessories, shoes, and every significant licensed costume you would ever want to wear can be found under the Rubie's brand. Still family owned and still family focused, Rubie's brings you fun for every season: Halloween, Christmas, Mardi Gras, Easter, and all in-between! Ant-Man costume jumpsuit with attached boot-tops; belt and mask. Join the fun when Ant-Man joins forces with the Wasp on an urgent mission! 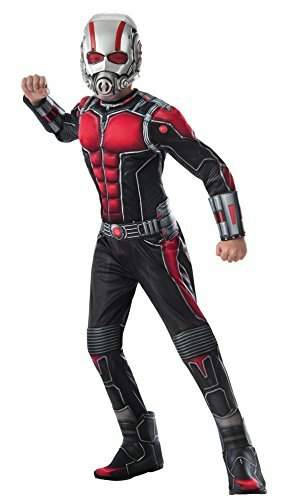 Marvel Ant-Man & The Wasp Child's Ant-Man Costume, Large. Family-owned, family-focused, and based in the U.S.A. since 1950, Rubie’s has classic and licensed costumes and accessories in sizes and styles for your entire family. 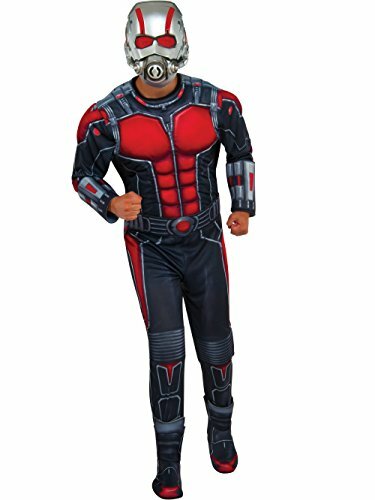 Ant-Man deluxe padded costume jumpsuit with attached boot-tops; belt and mask. Join the fun when Ant-Man joins forces with the Wasp on an urgent mission! 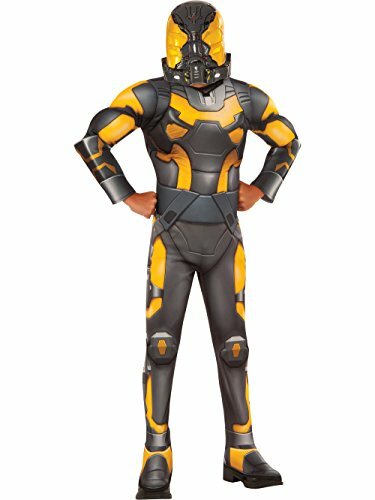 Marvel Ant-Man & The Wasp Deluxe Child's Ant-Man Costume, Small. Family-owned, family-focused, and based in the U.S.A. since 1950, Rubie’s has classic and licensed costumes and accessories in sizes and styles for your entire family. 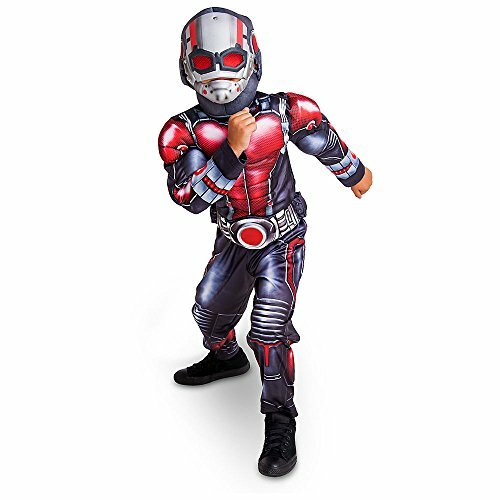 Your little Super Hero will grow in stature when transforming into the Ant-Man with this detailed costume. Inspired by the Marvel movie, the one-piece outfit comes complete with hood and attached mask, and a cool light-up belt. Officially licensed Marvel Ant-Man dress-up set. Welcome to Imagine by Rubie's, where it's play time, all the time! Imagine by Rubie's is a toy division of Rubie's Costume Company, Inc., offering a full line of dress-up costumes and accessories for children in separates as well as boxed sets. Each and every unique ensemble provides kids the opportunity to dress up as their favorite character 365 days of the year. It's our philosophy to encourage kids to dream, believe, and achieve through the art of imagination. 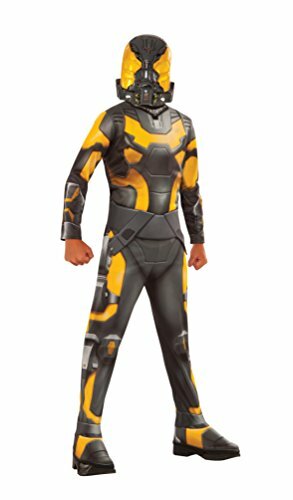 Officially licensed Ant-Man Yellow Jacket Deluxe Costume. Assimilate the powerful sting of an evil villain in this officially licensed Ant-Man Yellow Jacket costume! Rubie's Costume Company has been bringing costumes and accessories to the world since 1950. As the world's costume leader, we take seriously the mission to make dressing up fun. Mascots, rental quality costumes, masks, wigs, accessories, shoes, and every significant licensed costume you would ever want to wear can be found under the Rubie's brand. Still family owned and still family focused, Rubie's brings you fun for every season: Halloween, Christmas, Mardi Gras, Easter, and all in-between! Assimilate the powerful sting of an evil villain in this officially licensed Ant-Man Yellow Jacket costume jumpsuit and mask! Ant-Man is a licensed trademark of Marvel. Be sure to use the Rubie's Child Size Chart, do not buy based on child's age or clothing size. Family-owned, family-focused, and based in the U.S.A. since 1950, Rubie’s has classic and licensed costumes and accessories in sizes and styles for your entire family. Ant-Man and the Wasp Movie Gear Test & Toys Review! Make Your Own Ant-Man Suit! - Homemade How-to! I see a brave bunny, we all play some Lego Batman 3, another trip to Toys R Us, and Seth finally gets that Ant-Man costume he earned!